Amazon.com, the online superstore that now sells so much more than just books, offers its own Amazon Visa credit card through a partnership with Chase Bank. If you are a regular Amazon shopper this may be a credit card well worth looking into, as it does come with a number of nice rewards perks attached as well as an interest rate that matches up to some of the best in the credit card industry in general. The Amazon credit card is, in essence, very similar to any of the other standard Visa credit card offerings. It can be used at locations all over the world wherever Visa is accepted and cash advances can be made via ATMs worldwide. However the Amazon credit card does not come with an annual fee attached and boasts an attractive interest rate that can be as low as 13.24%, which is very competitive in today’s credit card market. The real reason though that a credit worthy consumer might choose the Amazon credit card over any others that they might be able to qualify for is the strength and value of the rewards scheme as it relates to shopping on Amazon in general. And these days on Amazon you can buy almost anything you can imagine, including food. The Amazon credit card rewards program awards in three different ways depending upon what you are actually purchasing. If you use your Amazon credit card to pay for purchases on Amazon.com itself you are awarded three points for every dollar spent, while gas and restaurant purchases earn 2 points per dollar. Any other purchases made on the card earn reward points on a one to one ratio, but as you can see, every purchase made with the Amazon credit card helps build up your rewards balance. One of the best things about this rewards program is that you do not have to accrue a great many points before you can begin redeeming them for rewards of a number of different kinds. As the Amazon credit card is essentially a branded Chase Freedom credit card you can redeem your rewards points for far more than just Amazon gift cards, although that is of course one of the many options available to you. Amazon credit card reward points can be redeemed for cash, gas gift cards, airline ticket discounts and even select vacation trips. When you have accrued just 2,500 points they can be redeemed for a $25 Amazon gift card and if you wait until you have 5,000 reward points credited to your account you can choose from a $50 gas card, $50 off Hertz or Avis car rental or even a $50 Marriott travel card. Hold out for much longer (or spend a lot more) and a round trip ticket to anywhere in Europe, Asia or South America can be in future. As the rewards points attached to the Amazon credit card do not expire you do have plenty of time to save up for that big trip if that is what you want to do with your rewards points. In addition to the basic rewards program Amazon usually offer some excellent sign up bonuses to those who apply, and are approved for an Amazon credit card. These usually come in the form of a credit to your card account of between $30 and $50, depending upon the promotion that the company is offering at the time. Another benefit attached to the Amazon credit card is that for the first six months of card membership there is an introductory APR of 0% offered on both purchases and balance transfers, although balance transfers are accessed a 3% fee when they are first initiated. In order to apply for an Amazon credit card an individual must be over the age of 18 and possess a valid social security number. The application for an Amazon credit card can be completed on-line and in most cases an approval is generated in just a few minutes. 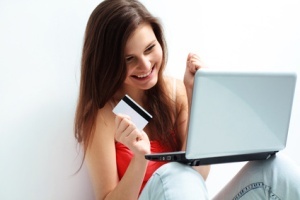 If you are approved, which usually requires an average to good credit rating, you can begin using a “virtual version” of your new Amazon credit card to make purchases on the site right away, but you will of course have to wait to get your physical credit card in the mail before you can use it anywhere else! Once you have an Amazon credit card managing your account on-line is very easy. Balances and available credit amounts can be accessed online at 24 hours a day, 7 days a week and Chase customer service representatives are available to answer any other queries during normal business hours. You can also opt to receive email and/or text alerts whenever there is any new activity on your Amazon credit card account. Amazon credit card holders also receive special card holder only deals, coupons and Amazon shopping offers on a regular basis.